If you take a look at the list of undefeated teams of the North American LCS starting with Week 3 of the Summer Split 2018 there is not a single team left, the current standings are dominated by Echo Fox and Team Liquid with three victories and one loss. After a great start into the new season the challengers of Team SoloMid had to accept two bitter defeats, generally all participants of the North American LCS have to work on their consistency on the rift. While the new season is approaching the exciting 2018 Rift Rivals tournament at the middle of the split with giant strides, all gladiators of the LCS have to fit together with the crazy meta game first. But before the ancient rivalry between Europe and North America peaks in a crazy live showdown we are able to witness some more weeks of creativity and new strategies. Week 3 of the NA LCS 2018 summer season starts with the clash between Cloud9 and Team SoloMid on June 30th at around 11:00 PM CEST, so don't forget to turn in for more action on Summoner's Rift. There will be two great delicacies for all League of Legends fans in Week 3 of the North American Summer Split: on the one hand, Cloud9 and Team SoloMid – the most frequent champions of the NA LoL Olympus – will clash against each other on Summoner's Rift. On the other hand, Team Liquid and Echo Fox – the two current leaders of the league – will carry each other to the extreme. The Golden Guardians have also played very amusing games so far and on the second match day they will also be able to play against Bjergsen and his team mates for more points. All major betting sites are already providing bets and odds for the upcoming matches of Week 3 of the NA LCS 2018 Summer Split, furthermore you can also bet your money on the overall winner of the Summer season. As always you will find a comparison of the most important League of Legends bets and betting odds of our renowned eSports betting providers right here. The betting odds listed below are always subject to change, just take a look at our LoL LCS 2018 betting odds site or follow the links to the betting sites for up-to-date information. You will find detailed predictions and analysis of the upcoming matches of the NA LCS Summer Split 2018 – Week 3 right before the first game of the week. The first match of the 3rd week will attract many North American fans, because the two crowd pullers Cloud9 and TSM will finally meet again. Both teams were disappointed last week and suffered two defeats, with C9 in particular now having a difficult position and being at the bottom of the LCS table. But for some fans the bad results are a satisfaction, because coach Bok “Reapered” Han-gyu announced that some changes have to be made before the third week and alluded to the C9 roster. Recently benched players Jensen and Smoothie are allowed back into the starting line-up, while Keith and Zeyzal have to return to the C9-Academy team. Whether Goldenglue or Jensen may start in Mid Lane and who of them has to go on Bottom Lane is still unclear. Perhaps Cloud9 also surprises us with a completely new strategy. Team SoloMid, on the other hand, continues to hold on to their squad with the controversial Bottom Lane consisting of Zven and Mithy. A disadvantage for the team is that although Zven is one of the best AD-Carrys in the world, this role has hardly place in the current meta. His attempt to cling vigorously to his pool of champions manifested itself in his two Ezreal picks last week. Compared to other marksmen, Ezreal can still be played, but does not seem to fit in with the rest of the team. But the crisis is still far away for TSM, because after a fantastic start into the new split with a score of 2-0, the two following defeats are only a small setback, and at least the games against the top favourites Team Liquid and TSM-Kryptonite Clutch Gaming are now behind them. Prediction: The strengths of the two teams in the direct duel are difficult to assess because it is not yet clear exactly what tactics Cloud9 could use in such an important game. I also think the team still lacks the class of Zach “Sneaky” Scuderi, who still has to play for the Academy team. I think the failures of the previous week were very instructive for TSM and the team will be better prepared for the upcoming tasks. So I expect a 0-1 victory for Team SoloMid. The top match of the evening will take place between the two leaders of the standings Team Liquid and Echo Fox. Both teams currently hold on to 3 victories and one defeat and are now dueling for the sole first place. After the first week in which the actual top laner Huni was used once in Jungle and once on Bottom Lane, Sam “Kobe” Hartman-Kenzler and Joshua “Jatt” from the Riot analysis team discussed in their Youtube series “This or That” whether Huni would be used next in his main position or whether he would try out Mid Lane before. And indeed, in the first game of the second week, he was placed in the middle, and to Echo Fox's annoyance, the game ended in a defeat. On the second day, Huni wanted to return to his usual surroundings on Top Lane, and this will probably also be the case in the third week. Team Liquid, on the other hand, had no surprises yet, the team continues to play with standard team compositions, even though Doublelift has tested several other champions in the solo queue in the last few days. Prediction: The strengths of these two teams couldn't be more different, while Team Liquid continues right where they left off in the spring split, Echo Fox enjoys taking advantage of the crazy metagame and tries everything imaginable to surprise the opponent. I think that even in a direct duel both teams will try to play through their game and play to their strengths, but I particularly appreciate Liquid's individual performances. So I expect a 1-0 victory for Team Liquid. Predictions: Six teams share third place in the standings with a score of 2:2, including 100 Thieves and Clutch Gaming. The 100 Thieves beat FlyQuest and Cloud9 twice last week and are well on their way to their former strength, but Clutch Gaming has also performed well so far and is still a candidate for the playoffs. This duel will definitely show which of the two teams can move upwards. I expect a 1-0 victory for the 100 Thieves. Prediction: The Golden Guardians have already clinched two victories in the first two weeks. Remember: At the end of the Spring Split they had only 4 victories after 18 games. However, the newly formed FlyQuest team has not yet been convincing, and the synergy between the players does not seem to be sufficiently pronounced. So I expect a 0-1 victory for the Golden Guardians. Prediction: The last game of the evening is also important for both teams to shed light on the current situation. As already mentioned, the NA LCS teams are currently still close together, but in the third week the table will be somewhat split and the good teams will be clearly distinguishable from the worse teams. I think CLG will be able to move up a bit after this game, while OpTic Gaming will drop for now because I expect a 0-1 victory for Counter Logic Gaming. Team SoloMid regained some confidence in yesterday's game against Cloud9 after the 0-2 score from last week. As we reported in advance, the match was dominated by the return of Jensen and Smoothie, who both delivered a solid performance and kept C9 in the game for a long time, but TSM had a too good team composition and pushed their opponents step by step back into their base. Zven chose Varus again, one of his favorite champions, but with the AP item build he avoided the weaknesses of the classic Crit ADCs. The Golden Guardians, on the other hand, tried a funnel strategy but failed miserably against FlyQuest. The team around Deftly always got into smaller fights in the jungle and always had the disadvantage because of the crowd control of the opponent. After just over 25 minutes, the Guardians finally had to admit defeat and thus continue their downward trend, which will not end in the match against Team SoloMid either. Prediction: The starting situation could not be clearer, TSM is the big favourite in this game and will not be beatable with surprising strategies. Zven continues to act as damage dealer and benefits from the team's good synergy with the new Jungler Grig. The betting providers are also of my opinion here and have incorporated the chances well into the corresponding odds. I expect a 0-1 victory for Team SoloMid. Prediction: FlyQuest scored their second win in this split at the beginning of week 3, but chances are not too good against CLG. AD-Carry Wildturtle seems a bit shaky at the moment and Jungler Santorin hasn't been able to help the team very much so far. I don't overestimate the difference between the two teams, but I expect a 1-0 victory for Counter Logic Gaming. Prediction: Clutch Gaming played the 100 Thieves in a 50-minute marathon match on the first day of the week, which ended in a defeat. Team Liquid, on the other hand, are now the sole leaders of the standings after their win over Echo Fox, proving together with ADC Doublelift that standard team compositions are far from extinct. I only give CG a 10% chance and expect a clear 0-1 victory for Team Liquid. The hopes of the fans were high when it became known that C9-Jensen was brought back into the team and could play against TSM. But the situation has only worsened, as FlyQuest's victory over the Golden Guardians has put Cloud9 all alone in last place with only one victory so far. Against Echo Fox a success is therefore absolutely essential, and Team Liquid has already shown how it works the day before: with a strong AD carry that can dominate Bot Lane. However, incomprehensibly Sneaky still has to play with the Academy Team, which is why a standard composition is out of the question at the moment. Rather, Goldenglue must act alongside Smoothie on Bot Lane, where he can then play champions like Brand or Vladimir. I think that both teams will meet with very similar strategies, the experiments of FOX-Huni are now nearly finished, only his champion pool remains a surprise bag. Prediction: The problems in the Cloud9 team are easy to understand, because first the squad is completely knocked over and then two mid laners have to play side by side, both of whom are now under pressure and have to recommend themselves if C9 needs a classic AD carry again. 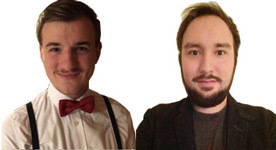 I think that Coach Reapered and owner C9 Jack Etienne have severely damaged the team with their decisions. The betting providers also see Echo Fox as clear favourites, although I do see opportunities for Cloud9. Nevertheless, I expect a 1-0 victory for Echo Fox. 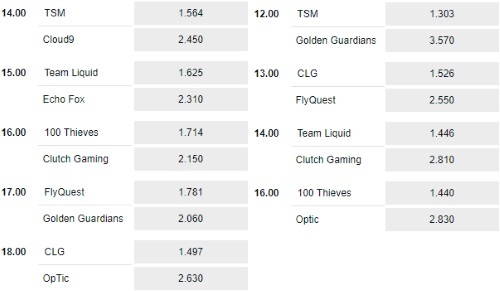 Prediction: The 100 Thieves could improve their situation significantly by beating Clutch Gaming and also go into the match against OpTic Gaming as clear favourites. After a disappointing first week, the Thieves are planning their fourth victory in a row, especially as star player Ssumday delivers great performances. I expect a clear 1-0 victory for the 100 Thieves.